Argentina's President Cristina Fernandez de Kirchner greets supporters outside a polling station in Rio Gallegos, Argentina, Oct. 25, 2015. Twelve years ago, laboratory owner Luis Azpeitia placed his faith in a little known center-left provincial governor, Nestor Kirchner, to lead Argentina out of a devastating economic collapse. Now, as the late Kirchner's wife Cristina Fernandez leaves power, Azpeitia finds himself reluctantly embracing a conservative presidential challenger. Azpeitia's shift illustrates how the couple's brand of leftist populism - known as Kirchnerismo - has alienated swaths of voters with its state controls on the economy and confrontational style. "People are fed up with Kirchnerismo," lamented the 62-year-old Azpeitia. "There are too many taxes, you can't borrow money, imports are restricted. You try and get by but it gets more and more difficult." "I'm not right-wing, but I don't want to be against the rest of the world," he added, referring to Argentina's fractious relations with Western powers, from Washington to London, under Fernandez. It's been a long slide down for Argentina, an expansive country that counted among the world's richest a century ago. The land that drew immigrants from around the world has stumbled from one economic crisis to another in past decades, while leaders who stand firm on workers' rights over big business do battle with supporters of open markets in search of sustainable growth. Fernandez's own mix of economic nationalism, expansive welfare system and trade and currency controls has likely polarized society even more and led to an unexpectedly competitive presidential run-off in three weeks. It pits Daniel, the candidate of Fernandez's ruling Front for Victory party who promised continuity with some gradual reform, against center-right rival Mauricio Macri who advocates sweeping pro-market reforms and had a surprisingly strong showing in the first round on Oct. 25. 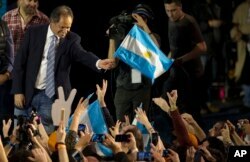 FILE - Ruling party presidential candidate Daniel Scioli holds an Argentine flag as he acknowledges supporters after primary elections in Buenos Aires, Argentina, Aug. 10, 2015. Scioli supporters fear Macri would be beholden to profit-hungry corporations and dismantle Fernandez's social welfare programs, even though he promises not to. "Macri says there's no poverty, but he would ruin us," said 24-year-old Alejandra Gonzales. "Before Kirchnerismo arrived, we had nothing. Nobody helped you." Between them, Scioli and Macri picked up almost three in every four of the 25 million votes cast. In a distant third place was Sergio Massa, the centrist candidate who pitched himself as a middle-way. Azpeitia's first ballot went to Massa. But with the 43-year-old lawmaker, whose constituency is Azpeitia's hometown of Tigre just north of the capital, out of the race now, he said voting for the more pro-business of the remaining candidates was a no-brainer. "I have companies asking me to open another laboratory. But with this government you can't take the risk of investing because there is no economic security," Azpeitia said. Argentina's next president will inherit a host of economic woes: weak growth is underpinned by unsustainable public spending, inflation is in double digits, the peso is over-valued and the central bank is precariously low on dollar reserves. As the commodities boom that fueled an explosive recovery from 2003-07 petered out, Fernandez has not been able to match her husband's economic success. But she is nevertheless widely adored by Argentina's lower classes for expanding social welfare programs, spending heavily on energy and transport subsidies and defending of workers' rights. Scioli and Macri share some common ground. Both prefer negotiation over confrontation and both promise to lure big investors and restore access to global debt markets to finance infrastructure. Where they diverge sharply is on the pace and depth of reforms to open up the economy. This combo of file photos shows three Argentinian presidential candidates, from left, Sergio Massa, Sept. 28, 2015; Daniel Scioli, Oct. 14, 2015; and Mauricio Macri, Oct. 3, 2015. The candidates' mounting attacks on each other look set to transform the rather dull campaign ahead of the first ballot into a bruising brawl. Scioli is portraying Macri as a threat to political stability and a throwback to the neoliberal policies of the 1990s that preceded the 2001-02 depression. A new pro-Scioli slogan has begun appearing on walls: "Fatherland or Macri". It echoes the popular "Fatherland or Vultures" catchprahase that has resonated with many Argentines in the country's fight with U.S. hedge funds over repayment of debt in default. Macri fires back that Scioli stands for continuity of populist policies that have driven up inflation and strangled investment. Scioli promised on Saturday to increase retiree pensions if he wins. Some, like Azpeitia, blame Fernandez's handouts for breeding a culture of dependency that the country can ill afford. Others cherish Fernandez for her welfare largesse and will vote Scioli in the second round on November 22. "She looks after you! She's been good to us," exclaimed Sara Baccarezza, 60, while sipping traditional mate tea in a downtrodden neighborhood outside Tigre. Baccarezza is among the estimated 40 percent of the population that receives a pension, salary or welfare from the government. She receives her late husband's pension and a caregiver allowance for her handicapped 24-year-old son, although she quietly admits he is not too severely impaired. Baccarezza would have voted for Fernandez had she been allowed by the Constitution to run for a third straight term in office. Instead, her vote in the run-off is firmly with Scioli. "Macri says there is no hunger, that we're all rich. But there is hunger and we are poor," Baccarezza said indignantly. How Massa's vote splits will be key to the final result. Last week, Massa unveiled key policy demands and said his 5 million supporters would vote based on how the two remaining candidates respond. He said he "did not want Scioli to win" but stopped short of explicitly endorsing Macri. "Kirchnerismo has done no good for the country," said close Massa ally Jose Manuel de la Sota, who governs Cordoba province. "This government has divided society."